Gift Certificate can be used for purchasing merchandise form the InsidePOOL Mall. The certificate can be emailed to the recipient and has no expiration date. 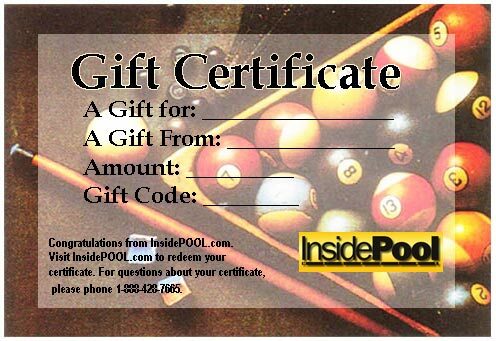 Printable InsidePOOL Gift Certificate for after purchase. *For security reasons, all gift certificate orders will be approved before the gift certificate balance is made available for sending. Once approval has been received you will receive an email with instructions on sending the gift certificate to your recipient.